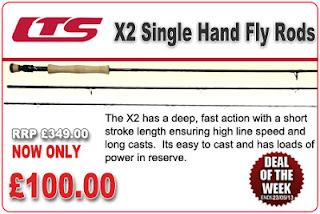 Deal of the Week is the LTS X2 Single Hand Fly Rod - RRP £349.00, now only £100.00! The LTS X2 Single Hand Fly Rod has a deep, fast action with a short stroke length ensuring high line speed and long casts. It leans toward effortless casting and has loads of power in reserve for the advanced caster. The LTS X2 is versatile and is suitable for all types of stillwater and river work. This is a fantastic bargain for a superb rod so don't miss this opportunity and get yours today while stocks last! !